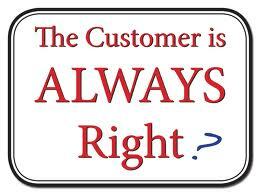 You've heard the expression, "the customer is always right". The problem with that is the customer is not always right. Furthermore, students aren't customers; they're products. When it's convenient for them to treat them as customers, such as during teacher evals (While I agree that students' needs have to be met, it's hardly fair for students to hold their teachers' careers in their hands. Studies have shown little correlation between high teacher evaluations and students' learning. Aren't teachers the ones who should be evaluating students? ), they do. However, when it's not convenient for them to be customers (astronomical tuition fees, for example), they don't. Admin needs to recognise this and realise that the proof is in the pudding. Having students who are able to compete in the real world is what they should strive to achieve. After all, most admin and teachers have been teaching for a long time and are experts in their fields; students, however, are not experts in evaluating teachers nor do they know everything about the subject they're studying. It's the teacher's job to teach them. By viewing them as products the admin will also make necessary changes, such as opening useful classes, fast-tracking graduation, having year round classes, giving credit for outside work, putting theory into practice, having student led classes, and so on. By treating students as customers, schools run the risk of lowering their standards just to keep students happy. It's a question of ethics and a shifting of power. Now students hold the power in their hands. Teachers are resorting to pizza parties and giving out grades like candy. Making classes easy, giving little homework, and just "having fun" in class is what many students would like if they were to be happy customers. Schools have to stop doing this and realise that they, with their years of experience and higher degrees, have their students' best interests at heart. Only when schools start viewing students as a product of their institution and not as customers, will everyone benefit. Here are some more articles about students as customers. The New York Times: Are they students? Or 'customers"? Tertiary 21: Do you see your students as products? The Washington Post: The real scandal behind the Yale course website.